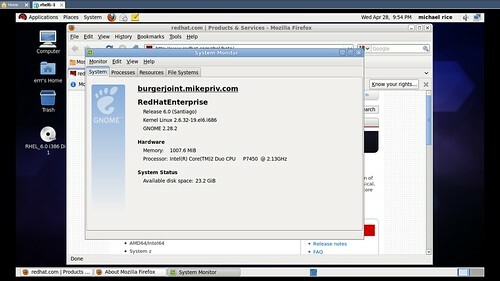 I spent a few hours tonight playing around with Red Hat Enterprise Linux 6 Beta release tonight. So far it seems really nice. I had no issues getting flash-plugin installed from Adobe. I installed irssi and setup my network to use a static IP. All tasks were very familiar feeling from past releases. I mostly messed around with desktop stuff tonight. Tomorrow I hope to get to setup Apache PHP and MySQL, and maybe a few days later I will step through a mail server as well with Postfix.